A tough New York cop goes undercover to crack an influential crime ring in this well-done gangster movie starring Edward G. Robinson, Humphrey Bogart. Get two gangster-movie icons for the price of one as tough police detective Edward G. Robinson faces off for the first time against Humphrey Bogart, the ambitious enforcer for a big-time racketeer. Bogart’s effectively the co-star–virtually a one-man crime wave–though he rates only fourth billing behind Eddie G., Joan Blondell, and Barton MacLane. Still, no question it’s Robinson’s movie; the former “Little Caesar” walks the line beautifully as an honest cop who, unjustly jettisoned from the force, agrees to go to work for the mobster (MacLane) he’s long pursued. 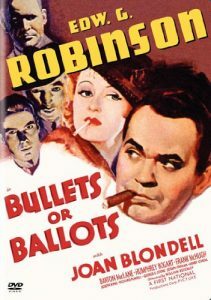 A fascinating air of fatalism attaches to Robinson’s character, whether shrugging off his betrayal by the new police commissioner (and his oldest friend), trading polite threats with his new criminal colleagues, or dismissing the possibility of happiness with the nightclub operator (Blondell) who clearly cares for him.